The Disability Compensation Law is a workers compensation law poster by the Hawaii Department Of Labor and Industrial Relations. This is a mandatory posting for all employers in Hawaii, and businesses who fail to comply may be subject to fines or sanctions. This poster must be posted in a conspicuous place where all employees will see it. This poster describes the rights employees have to Workers' Compensation, Temporary Disability Insurance and Prepaid Health Care. It appears you don't have a PDF plugin for this browser. Please see the link below to download hawaii-disability-compensation-law-poster20151110.pdf. employer pays the entire amount. tothe surviving spouse and other dependents. fromthe date of disability if you suffer a disabling non work-related injury/illness, or inability to work because of your pregnancy. 20hours per week; and earned at least $400. your employer for details if they have an "equivalent" plan. hospitalthe name of your employer's health care contractor and the plan name. one-half the premium cost (whichever is less). Your employer pays the balance. 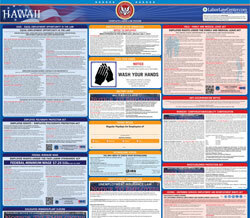 *You may satisfy Hawaii Labor Laws’ posting requirements by posting our official labor law poster.